Disaster managers and scientists in Sikkim are keeping a close watch on a lake formed due to melting of glaciers to see how successful is an experiment they began two years back to siphon off excess water from the lake to prevent it from bursting. Floods caused due to outbursts of such lakes, known as Glacial Lakes Outburst Floods (GLOFs), are a subject of concern in the Sikkim Himalayan region as several lakes have been formed due to melting of scores of glaciers in the region. In order to prevent any disasters due to outbursts from such lake, a project was started in the South Lhonak lake where in high density polyethylene (HDPE) pipes have been installed to siphon off water from the glacial lake. The disaster mitigation initiative is important as many glacier lakes have been formed due to melting of glaciers. Retreat of glaciers in the wake of global warming is expected to increase the number of glacier lakes and also expand the size of the existing ones. “Three pipelines have been installed and they are discharging water at the rate of 50 to 60 litres per second each,” Dhiren G. Shrestha, additional director in the Remote Sensing Division of Sikkim State Council of Science and Technology, explained while speaking to India Science Wire. Each pipe has a diameter of eight inches. However, he said, transporting the pipes to high altitudes poses serious challenges. Yaks were used to carry the pipes and other materials to the lake situated at 17,000 ft. “The way to the lake is full of steep and narrow passages. 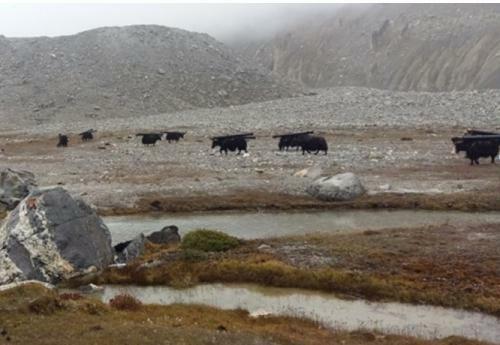 Only Yaks could manoeuvre them and take the pipes safely to the destination,” he said. The Sikkim State Climate Change Cell under Sikkim State Council of Science and Technology, carried out the work in collaboration with the Land Revenue and Disaster Management Department. Sonam Wangchuk of Ladakh-based NGO, Students' Educational and Cultural Movement of Ladakh (SECMOL), was also involved in the project. During a recent expedition, a team managed to survey the outer areas of the area and found that huge amounts of water are flowing from the North Lhonak glacier. The inflow is almost same as what South Lhonak Lake is discharging. “It would be difficult to assess how water level decreased by how much. 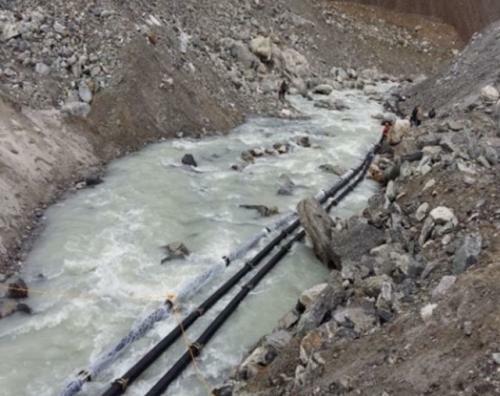 We see the discharge as is purely a disaster mitigation effort,” Shrestha added.